This gives the ability to file VAT returns without having a full digital accounts package setup behind it. However, we strongly believe that this is not the correct approach to Making Tax Digital and HMRC have made it clear in their releases that they expect businesses to keep full digital records, regardless of whether bridging software is in use or not. That’s not to say there isn’t a place for bridging software. The April 2019 deadline is very close, and for many businesses they are not prepared for the change. In this case, bridging software could be used as respite. However, the risks are not eliminated, and anyone using bridging software should be also looking to adopt a more practical and future-proof digital accounting solution as soon as possible. This doesn’t have to be a difficult transition, as Llewellyns Accountants have already helped over 300 businesses through this process. Bridging Software has no data source to pull from. It is entirely dependent on the figures that you provide it with. As long as your figures are correct, this wouldn’t be an issue… but digital bookkeeping software has all the supporting data already present, meaning there is always something to reconcile the final figures against, and this is done automatically. Bridging software allows manual entry of a VAT submission before sending over the API to HMRC. This is certainly against the spirit of making tax digital, and the above implies that it also falls short of HMRC requirements. Even though bridging software would accommodate, for example, working from a written ledger… HMRC have made it clear that they expect the supporting records to be kept digitally. The reason for this is in the next point…. In the future, there is no guarantee that bridging software will be able to cope with the demands of Making Tax Digital. Whilst it satisfies the VAT return for now, in the future HMRC may require additional (or even total) supporting data as part of the return. If this happens (and it seems likely) then bridging software will no longer work. Ultimately this means that bridging software can only be seen as a short term solution at best. 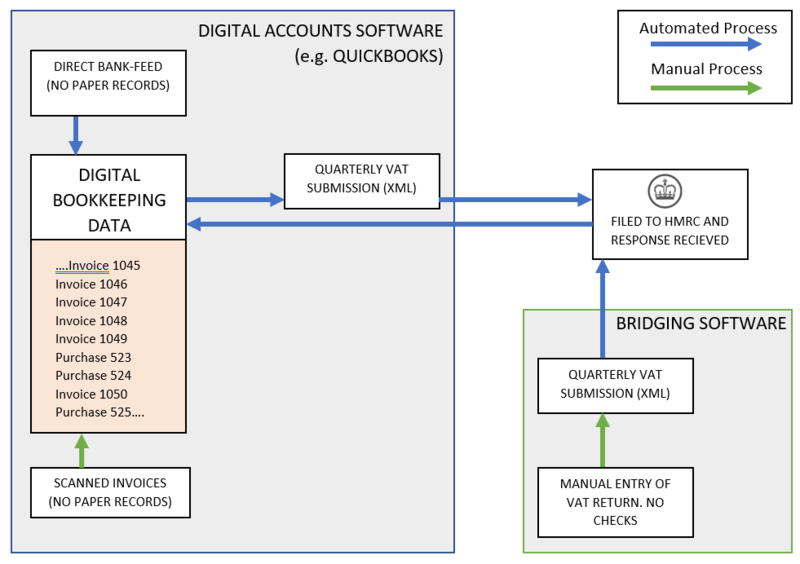 With a full digital book-keeping system, the VAT return can be compiled from the data within. This not only makes the VAT submission much easier to calculate, but also means that it is entirely derived from the supporting data. The chance of human error being a factor when entering the VAT totals for submission is eliminated. Ultimately, Making Tax Digital is not about a VAT submission, that is merely the beginning of a long road ahead for HMRC where more and more data is submitted automatically through the MTD system. It’s clear from reading the various VAT notices that HMRC is expecting businesses to keep full digital records, and in the future they may ask for a subset, or even a full submission, of these records for fraud prevention and data integrity purposes. If this happens, bridging software will become immediately obsolete. Businesses that will rely on bridging software may soon find themselves in the same position as they face in April 2019, only this time there will be no band-aid solution. The right time to adopt Digital Account is now, and in it’s entirety. Digital Accounts also have a great deal of benefit over traditional paper based systems. The banks feeds are now automated, so there is no need to input any banking data. Invoices can be scanned into the software and (with a few exceptions) this is sufficient record keeping as far as HMRC are concerned. No more searching for lost invoices, and filing cabinets wasting office space. Individual customer accounts can be easily managed, and overdue accounts can be dealt with effectively. The advantages far outweigh the small effort required to get started with digital accounts, and Llewellyns Accountants have already successfully transitioned over 300 businesses to digital accounts and bookkeeping.